Thomas, Graeme; Fernández, Walter: Success in IT projects – A matter of definition? ; in: International Journal of Project Management, in press (2008). A lot of IT projects are not successful. One of the problems seems to be that success is a tricky concept. The GAO considers (IT) projects as challenged if they are about to exceed their budget and/or schedule by 10%. As such most projects fail. Several best practice studies have pointed out that agreeing on success criteria is better down upfront, they should be consistently measured, which includes a proper baseline, and their measurement results must be used. 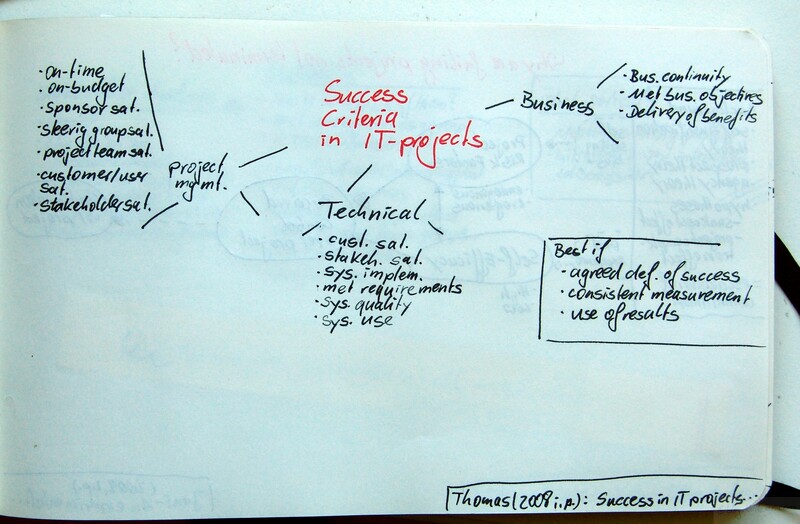 Thomas & Fernández collect examples for IT project success criteria in three broad categories: project management, technical, and business criteria. This entry was posted on Donnerstag, Oktober 9th, 2008 at 19:14 and is filed under Failed Projects, IT Project, Success Criteria. You can follow any responses to this entry through the RSS 2.0 feed. You can leave a response, or trackback from your own site.